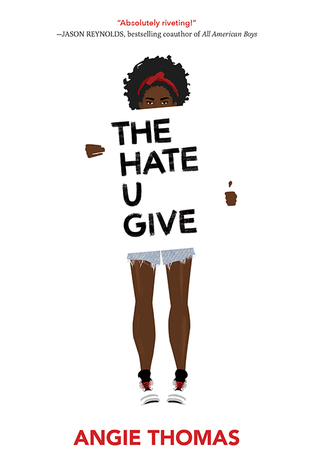 goes to a white private Williamson in “The Hate U Give” (2017 Balzer & Bray) by Angie Thomas. Starr attends a party in the hood where she knows she doesn’t belong. She meets up with Khalil, her best friend until he recently started selling drugs. A fight breaks out. Khalil grabs Starr’s hand and they drive off. A white cop stops them for a broken taillight and orders Khalil out of the car. Starr hopes Khalil knows what her Daddy has drilled into her—“Keep your hands visible. No sudden moves. Only speak when spoken to.” Khalil bends his head to ask Starr if she’s okay and the cop shoots him. He dies in Starr’s arms on the street. We experience Starr’s loving complicated family. Daddy is an ex-con who got out of the neighborhood gang by serving time for the gang leader. Momma is a nurse working in the clinic. Starr’s parents work hard to protect their kids. Seven is her older half-brother whose other family is fathered by the abusive gang leader, King. Seven, Starr, and younger Sekani all study at Williamson where Starr has a white boyfriend, Chris. Starr says, “ . . . am I betraying who I am by dating him?” Her Black Panther Daddy would think so, and it doesn’t go over easy when he discovers the relationship in the midst of the hood riots. If Starr comes forward as the witness, her family will suffer repercussions in the hood. She’s reluctant, but circumstances move her to act. On the news, Khalil is described as a thug, as if to excuse the cop’s action. Her uncle is a detective and vows to protect her. Can he? Starr battles racism at school at the hands of blond Hailey. But Maya, her Asian friend says, “We minorities must stick together.” Chris is frustrated by Starr’s secrets. But she can stand on her feet and won’t take any nonsense, just as her Momma won’t. “Daddy once told me there’s a rage passed down to every black man from his ancestors, born the moment they couldn’t stop the slave masters from hurting their families.” You accept Daddy’s rage, and, boy, do you worry for him. You see him humiliated by cops in front of his children. You love every member of this family who is trying to change a bad situation, but in a real way. There is nothing sugar-coated or easy here. Wow!